Whether you are just beginning to build your solutions on AWS or expanding your offerings, the APN is a great place to start. The APN has various programs and support to help you in your journey. Registering for the APN is just the beginning. We engage on a deeper level with APN Partners who advance through the tiers, so don't stop here. Focus on making your products in General Availability on AWS and getting AWS customers to invest in your solution. This is only the first step of your journey, and we recommend you check out the steps to advance to the Select Tier. Check out AWS Answers to learn from AWS architects on how to build and grow your business on the AWS cloud. Explore AWS Quick Starts to learn the gold-standard on deploying on AWS. 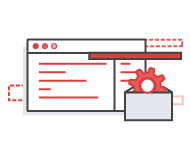 Earning AWS Certification helps you demonstrate your deep technical skills and expertise to design, deploy, and operate applications and infrastructure on AWS. AWS Certification is a industry-recognized credential, and shows customers, employers, and recruiters that you have the skills and knowledge to build AWS solutions. One AWS Technical Certified Individual is required at the Select Tier. For each AWS Certification completed, you will receive AWS Promotional Credits. Certification exams can be scheduled through the APN Partner Central. Visit the AWS Certification page to learn more. Build a solution that follows the AWS Well-Architected Framework and follow best practices for security, high availability, support, costs, and automation on AWS. Doing so will help you understand how to architect your product in a way that is secure and compliant. Want more information on building a solution that follows the AWS Well-Architected Framework? 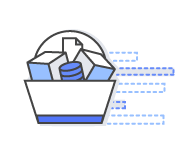 Check out AWS Answers to see repositories of instructional documents and solutions developed by AWS architects to help you build and grow your businesses on the AWS Cloud. Once you have built a solution that is generally available on AWS, you can start building your customer base. In order to advance to Select Tier, you must show direct revenue of $15,000 over a rolling 12-month period or have 3 three launched opportunities with a total monthly recurring revenue (MRR) of $1,500. Additionally, you must designate one of your opportunities as publcily referenceable and obtain 5 Customer Satisfaction Responses to showcase that Customers are finding value from your product. It's very important that you establish credibility with your existing customer base, and demonstrate how your solution has helped them meet their business needs. Need a little help? Learn how to build your AWS-based business in this whitepaper. Use the following checklist to confirm that you meet all the requirements for the Select Tier. If you comply with the requirements, then congratulations! You have completed everything you need to apply to become a Select Tier APN Partner. Now you can apply to upgrade. To apply, log into the Partner Central, go to your Partner Scorecard, and click “Apply for Upgrade”, found at the top of the page. A member of the APN Team will be notified of your submission and will be in touch with next steps. If you're not yet in compliance with all of the requirements for the Select Tier, we encourage you to keep working. Select Tier APN Partners receive a number of additional benefits, so don't stop now! Looking for all the APN Technology Partner Benefits & Requirements on one table? Click here. At the Select Tier, you gain access to a number of additional benefits to help you build your customer base. You're able to participate in additional APN Partner Programs to differentiate your business, and you become eligible for a number of funding opportunities. You also have the opportunity to take advantage of a wide range of marketing resources through APN Marketing Central. AWS Public Sector Partner Program: The Public Sector Program enables public sector partners to accelerate their business growth on AWS through alignment with our public sector teams. APN Customer Engagements Program: Under the APN Customer Engagements Program, eligible APN Partners can receive AWS generated leads and opportunities through Opportunity Management Platforms as well as access to sales and technical support resourcs to drive a successful customer outcome. APN Navigate Tracks: The APN Navigate Tracks provides a prescriptive path for APN Partners to specialize on AWS. If offers guidance to APN Partners on how to become AWS experts and deploy innovative solutions on behalf of customers. Proof-of-Concepts: At the Select Tier, you become eligible for the AWS Proof of Concept (POC) Program, which is designed to facilitate and help accelerate AWS customer projects. Innovation Sandbox: This benefit extends AWS Promotional Credits towards the development of new offerings on AWS and can help you as you look to offer Free Trials of your solution to prospective customers. AWS Promotional Credits: APN Partners at Select Tier will recieve annual AWS Promotional Credits as well as additional AWS Promotional credits for every individual who has attained Associate, Professional, and/or Specialty certifications. Partner Opportunity Acceleration Funding: APN Partners will have access to Partner Opportunity Acceleration funding. This is available through the Partner Acceleration Tool in Partner Central. Access to APN Marketing Central: Are you looking for resources to help you get started as you build a robust go-to-market strategy on AWS? Look no further than APN Marketing Central! APN Marketing Central provides a wealth of marketing tools and resources that enable you to generate demand for your services and solutions on AWS. Eligible for AWS Event Sponsorship: At the Select Tier, you are eligible to sponsor AWS Events, including re:Invent and AWS Global Summits. Want to learn more about how to take advantage of the AWS Sponsorship opportunities? Click here. APN Badge Manager Access: Once an APN Partner reaches the Select Tier, they gain access to an official APN Badge as well as and badges related to designations they achieve. From there, APN Select Tier partners can customize a badge. APN Partners may also be eliglbe for other logo usage as outlined in the APN Marketing Toolkit. Company Profile in the Partner Solutions Finder: At the Select Tier, APN Partners are able to create an Partner Solutions Finder listing. The Partner Solutions Finder is one of the most effective ways for an APN Partner to surface to prospective customers. Access to the AWS Educate Job Board: This benefits allows APN Partners open positions with top university talent. Students can search job requisitions that match their selected job family and skill set, and apply for positions directly in the Job Board. Becoming a Select Tier APN Partner opens up a number of Go-To-Market opportunities you can take advantage of to help you grow your customer base on AWS. You also gain official recognition as an APN Partner through the ability to list your firm in the Partner Solution Finder and through your access to an official APN badge. But don't stop here. While at the Select Tier, we recommend that you focus on how you can innovate with your own solutions and move up to the Advanced Tier. Start Marketing yourself as an APN Partner with APN Marketing Central. 4 AWS Technical Certified Individuals are needed at Advanced Tier. Of the 4 certified individuals, 2 must be Professional or Speciality certified. For each AWS Certification completed, you will receive AWS Promotional Credits! Prior to moving to Advanced Tier, we want to ensure your solution follows architectural best practices for designing reliable, secure, efficient, and cost-effective systems in the cloud. This AWS Well-Architected Framework will help you pass the Technical Baseline Review validation needed to continue to Advanced Tier. 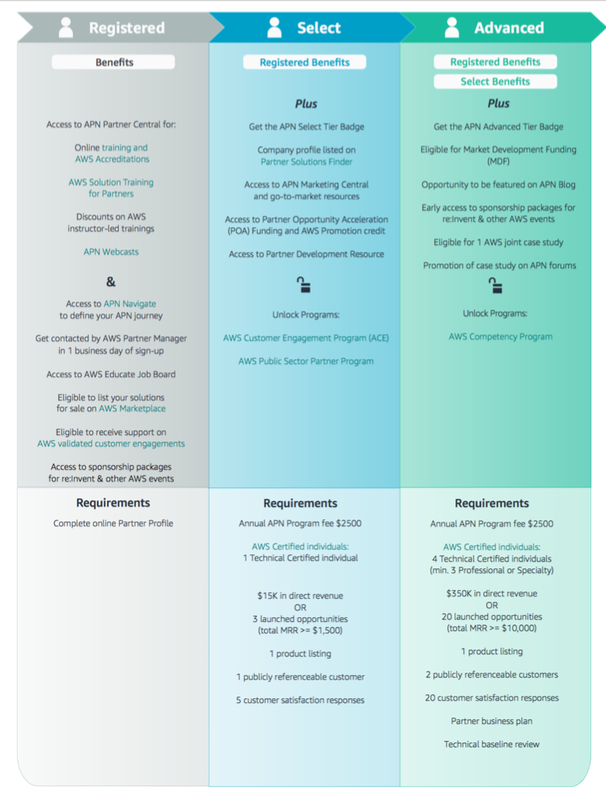 To qualify for the Advanced Tier, you must demonstrate your long-term investment in being an APN Partner by investing in staff dedicated to managing your AWS relationship. The Advanced Tier requires you have a dedicated Partner Alliance Manager on staff. Additionally, you must develop a comprehensive AWS Partner Practice Plan. You can download a practice plan template via the APN Partner Central. To qualify for the Advanced Tier, you must meet minimum direct revenue or launched opportunities minimum. To qualify for the minimum direct revenue, you must have $35,000 in cumulative revenue derived from AWS Accounts that are owned by the APN Partner over a rolling 12-month period. This includes AWS accounts used for internal production, test, or devlopment workloads. To qualify for the minimum launched opportunities, you much launch 20 opportunities over a rolling 12-month period with a total combined estimated monthly recurring revenue (MRR) of $10,000. All opportunities are to be tracked and managed via the Opportunity Management tool in APN Partner Central. To increase your AWS direct and influenced revenue, we recommend that you participate in the programs and marketing opportunities available to you at the Select Tier. Doing so will increase your exposure to AWS customers, and will provide you with more opportunities to grow your AWS-based business. Alternatively, you can fulfill this requirement by becoming an approved AWS Competency partner, which demonstrates your proven expertise and deep customer success in a particular area of focus on AWS. Utilizing existing customer references is one of the most effective ways to reach new customers, and to demonstrate your success on AWS to AWS teams. As you continue to build a successful AWS-based business, be proactive about reaching out to your existing customers who you feel are strong references for your firm. Examples of references you can pursue include a testimonial for your website, a formal case study, a speaking opportunity at an event, or a customer profile for your blog. To become an Advanced Tier APN Partner, you must obtain two publicly referenceable customers on AWS. Did you know that you can access a number of case study templates through APN Marketing Central, to help you as you look to build your reference base? Click here to learn more. You will also need to obtain 20 customer satisfaction responses through the "Rate this Partner" function within your APN Partner Solutions Finder (PSF) listing. Use the following checklist to see if you meet all the requirements for Advanced Tier. If you comply with the requirements, then congratulations! You have completed everything you need to apply to become an APN Advanced Tier Partner! Now you can apply to upgrade. You can do this by logging into APN Partner Central, going to the Partner Scorecard, and clicking “Apply for Upgrade” found at the top of the page. A member of the APN Team will be notified of your submission and will be in touch with next steps. Once you qualify for the Advanced Tier, you gain many more opportunities to differentiate your firm to prospective customers. For example, Advanced Tier APN Partners are eligible to apply for the AWS Competency Program, AWS Customer-Facing Webinars, and an AWS-Written Case Study. Some of the most effective Programs we offer to help customers find the right partners to help them meet their business needs on AWS. AWS Competency Program: The AWS Competency Program is designed to highlight APN Partners who have demonstrated technical proficiency and proven customer success in specialized solution areas, verticals, and use cases. Marketing Development Funds (MDF) Program: This program is designed to enable demand generation and go-to-market (GTM) activities for your firm. Eligibility for Integrated Partner Campaigns: These comprehensive multi-touch integrated demand generation campaigns provide an opportunity for you to co-brand digital marketing assets, social media, webinars, and outbound calling to generate more qualified opportunities for your firm. Note that you also need to hold an AWS Competency to be eligible for this program. Priority Listing in the Partner Solutions Finder: At the Advanced Tier, you are given priority listing (just below Premier Tier APN Partners) in the Partner Solutions Finder, increasing your firm's visibility to prospective customers. Specific APN Badges Recognizing Advanced Tier Status: As an Advanced APN Partner, you have access to specific APN badges which recognize your status. Dedicated Partner Development Manager: Once you reach the Advanced Tier, you will gain access to a named Partner Development Manager to help you continue to achieve your goals on AWS. Elgiible for Joint AWS Case Study: As an Advanced Tier APN Partner, you are eligible for one written case study that highlights your success in solving specific business challenges of AWS customers. Case studies may be featured on various AWS web assets and AWS-operated events. APN Blog Guest Post: Advanced Tier APN Partners are also eligible to co-create a guest post on the APN Blog. By becoming an Advanced Tier APN Partner, you demonstrate that you have built a strong AWS-based business. Continue to differentiate and stand out to AWS customers, and build a robust go-to-market strategy with AWS. Establish your firm’s thought leadership through event sponsorship, blogging, social media, presentations, and whitepapers. Join programs that will help you further define your niche on AWS, such as the AWS Competency Program. Work with the AWS Partner Team on Integrated Marketing Campaigns and other Partner Marketing campaigns. Apply for AWS Competencies to differentiate your firm. Continue to innovate, differentiate, mature, and grow your practice on AWS by taking advantage of more APN Partner Programs, and developing new areas of expertise on AWS. 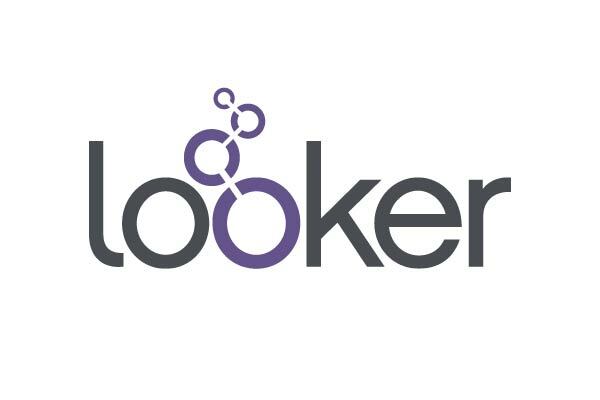 Keenan Rice, VP of Alliances at Looker, discusses why Looker chose to go all-in with AWS as an AWS Partner Network (APN) Technology Partner. Looker, a business intelligence and analytics platform, holds three AWS Competencies (Big Data, Marketing & Commerce, and Mobile), and has seen substantial business growth since becoming an APN Partner. Looker has experienced 5x revenue growth in the past year. MicroStrategy is an Advanced Technology Partner in the AWS Partner Network (APN), and is all-in on AWS. Hugh Owen, Senior Vice President of Product Marketing at MicroStrategy, speaks about why the company chose to go all-in on AWS, and some of the benefits MicroStrategy has gained being an APN Partner. Okta is an Advanced AWS Partner Network (APN) member, and an AWS Security Competency Partner. Hector Aguilar, CTO, and Allen Clark, VP of Partnerships, discuss Okta's decision to build its identity management solution on AWS. They also discuss the value the company has found being an AWS Security Competency Partner, and integrating new AWS services, such as AWS Key Management Service (KMS), into the Okta offering. Olga Lagunova, Vice President of Software Engineering at Pitney Bowes, an APN Advanced Technology Partner, discusses how working as an APN Partner drives innovation at Pitney Bowes and helps the company bring additional value to its end customers. Karl Van den Bergh, Vice President of Product and Cloud at TIBCO Software, discusses the ways in which TIBCO has been able to reduce costs by over 50 percent and deliver software to market in a much faster time frame by working with AWS. TIBCO is an APN Advanced Technology Partner, and is all-in on AWS.